Continuing on from last week’s look at the mountain venues, today we’ll explore the city venues of the Vancouver 2010 Winter Olympics. The Games’ opening and closing ceremonies, along with nightly ‘Victory Ceremonies’ (which we assume means medal presentations) will be held at BC Place in downtown Vancouver. North America’s largest air-supported roof will ensure all these festivities can proceed without interference from inclement weather. For the opening ceremony in particular, a vast security cordon was in place to ensure planned protests1 did not disrupt proceedings. Right next door is Canada Hockey Place, perhaps the focus of this hockey-mad nation’s attentions for much of the next few weeks. Olympic naming regulations mean the arena has to be stripped of its usual branding as General Motors Place, despite the fact that GM is one of the IOC’s largest sponsors. Also the arena’s usual tenants – the Vancouver Canucks – have been forced to go on the longest road trip in NHL history because of the Games. Some hockey games will also take place at the University of British Columbia’s Thunderbird Arena. East of downtown, the Pacific Coliseum will house the figure skating and short-track speed skating events. Dating to the 1960s, this arena has undergone significant renovations to prepare it for the Olympics. 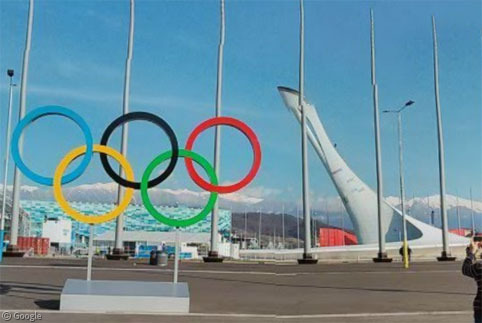 A number of new venues have been constructed for these Games, including the spectacular Olympic Oval with stands beside the Fraser River in the suburb of Richmond. 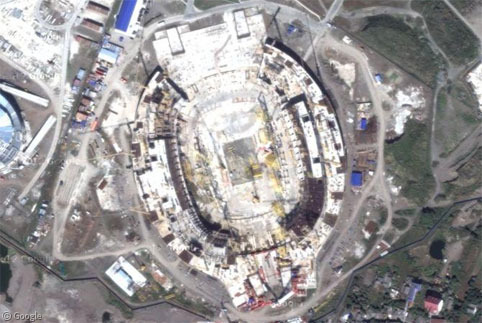 While emphatically non-oval in shape, the building is named for the long-track speed skating course inside, which will hold close to 8,000 spectators. The $178 million construction project includes an elaborate rainwater collection pond and associated sculptures known as the Water Sky Garden. There has been a minor controversy regarding practice time at this venue, with allegations that Canadian athletes are benefiting from privileged access. Another new venue is the Vancouver Olympic Centre which will host the curling competitions. This building is conveniently surrounded on all sides by baseball diamonds, should the athletes want a change of sport. It will be converted into a community centre after the Games. As part of an effort to stage the ‘greenest’ Games ever, both new buildings were constructed to high levels of LEED certification. The wood used for the roof of the Richmond Oval came from forests killed by a pine-beetle infestation, rather than cutting down live trees. The 2,700 athletes participating in the Games will be housed in the Vancouver Olympic Village on the south-east shore of False Creek. Construction of these buildings hit serious financial difficulties courtesy of the same investor that may have to sell the Whistler resort during the Games, as mentioned in the Mountain Venues post. They were finally finished at a total cost of $1 billion, and will be sold off after the Games to recoup some of that money. Meanwhile, the thousands of media representatives will work in the Media Centre located in the Canada Place / Convention Centre complex on the waterfront. The port and harbour will host a significant number of cruise ships for the duration of the Games – providing accommodation for visitors unable to secure a hotel room, as well as members of police and security forces. To the west of the harbour, near Stanley Park, a 14m tall set of Olympic rings lights up every evening.